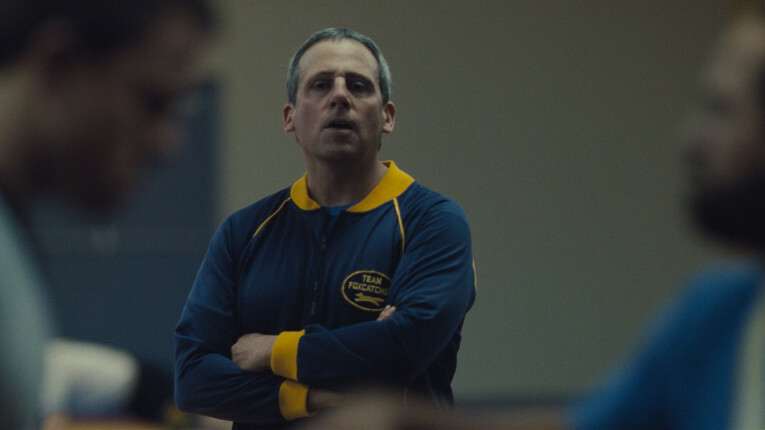 In most reviews of Foxcatcher there is very little criticism of what’s actually on screen. The few negative comments tend to focus on what’s not there—and that might be because, for a film that adopts a very linear, stepwise approach to narrating a very strange episode in American social history (no flashbacks, flash forwards, parallel storylines); there is a decided refusal to over-explain. But saying that risks selling short three completely committed performances from Channing Tatum, Mark Ruffalo, and most notably Steve Carell. I can’t praise Carell’s performance highly enough—I’m tempted to compare to other notable cases of big-box-office comedians going serious, like Robin Williams, whose comedic persona you felt was always winking at you, even with the darkest of roles, as in the Insomnia remake. Carell by contrast disappears 100% into the role of the mentally ill heir to the du Pont family fortune, John E. du Pont. Bennett Miller’s previous film, Moneyball, is, by contrast, and by design, much easier to like. Underdogs are much more sympathetic than deluded overdogs I suppose—and if Brad Pitt’s Billy Beane has surplus cockiness and rough edges, it’s balanced out not only with a charming father-daughter interlude or two, but also by his ready recognition of what Jonah Hill’s analytics nerd Peter Brand brings to the table. Before I re-watched this film on Netflix I found myself wondering whether it would still hold up for me, or whether my warm and fuzzy memories from seeing it in initial release resulted simply from the unexpected pleasure of seeing a “sports movie” that was really about intelligence and integrity. I needn’t have feared—I’d forgotten just how much sheer art went into Moneyball‘s conception and execution. Deserving of special mention is the brilliant musical score by frequent Atom Egoyan collaborator Mychael Danna, to which the film owes much of its mastery of tone.